We are concerned Canadians who cannot remain indifferent and quiet to the massacre of innocent civilian Palestinians whose only crime is their peaceful protest of a brutal and illegal occupation. Palestinians in Gaza live in an open prison denied basic necessities, electricity, clean water and medicines. The UN has already declared Gaza an unlivable place. How many Palestinians should die or get injured before the world would wake up to these war crimes? Why are Canadians silent and oblivious to these crimes against humanity? We are calling on our government, our representatives in parliament, the human rights organizations and fellow Canadians to condemn and protest the slaughter of innocent people who are exercising their natural right to resist peacefully their occupiers. We are calling on Canadians to condemn those who have imprisoned and besieged their land and water and those who have denied them their basic human rights. Portraying all Palestinians in Gaza as members of Hamas or their protest as a terrorist activity is a callous trick to dehumanize them and justify their massacre. We call on all Canadians and particularly the constituency of justice and peace to raise their voices in protest of these war crimes. Those who are silent at this juncture are complicit with these crimes. It is time to assert that Palestinians’ lives are precious too and that Canadians do not acquiesce with the brutal and disproportionate use of violence by the Israeli military against unarmed civilians. It is high time that Canada lives up to its obligation as a high signatory under Article 1 of the Fourth Geneva Convention which requires that the Convention is upheld in all circumstances. Beyond this our domestic legislation, the Special Economic Measures Act, calls for action where gross and systematic human rights violations have been committed in a foreign state. Based on international and domestic law we call on the Canadian government to condemn Israeli actions and that a military embargo be put in place. 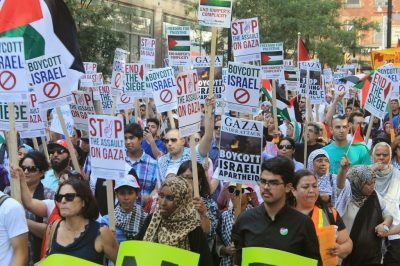 Our organizations demand the Canadian government to call for the lifting of the blockade on Gaza, and to denounce the opening of any embassies in Jerusalem/Al Quds. We join together to demand that the Canadian government immediately call Israel to cease and desist the massacre of civilians and recall the he Canadian ambassador to Israel until Israel abides by its obligations under international law to protect Palestinian civilians. On Monday (May 14), Canada’s New Democrats strongly condemned the killings of protesters in Gaza by Israeli Defence Forces and urged the Liberal government to take a more active stance for peace and human rights. According to numerous news reports, at least 55 Palestinians in Gaza were killed and around 2,000 were injured Monday by the Israeli military in demonstrations near the Gaza-Israel border. The protests follow the decision by U.S. President, Donald Trump, to relocate the American embassy to Jerusalem and recognize the disputed city as the capital of Israel. Trump’s move has been widely criticized by the international community, as this move will further destabilize the region and hinder the peace process. The Liberal government has refused to condemn Trump’s decision. Canadians for Justice and Peace in the Middle East (CJPME) condemns Israel’s shooting of London, Ontario based doctor Tarek Loubani, shot while attending the wounded in Gaza. Despite being clearly identified as a first responder, Loubani sustained a moderate injury to his left leg, and a minor injury to his right leg. A friend and colleague of Loubani’s, paramedic Musa Abuhassanin was killed, along with at least 54 other Palestinians in Gaza yesterday. 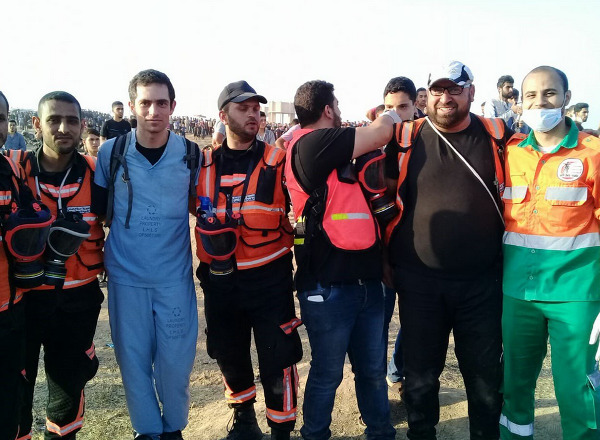 Loubani makes regular medical missions to Gaza, and was trying to provide medical treatment to Palestinian protesters injured by Israeli snipers. Monday was the bloodiest day yet of a weeks-long protest in Gaza where Palestinians seek to call international attention to the “Nakba”: the dispossession and loss suffered by Palestinians as a result of the UN Partition Plan of 1947. International condemnation of Israel’s violent response to the protest grew yesterday, as UN human rights chief, Zeid Ra’ad al-Hussein condemned the “shocking killing of dozens” by Israel, and the EU called on Israel to respect the principle of proportionality. The Trudeau government’s response was muted, with foreign affairs minister Chrystia Freeland refusing to call out Israel on its bloody response to what is a passionate, but manifestly peaceful protest. However, NDP Leader Jagmeet Singh asserted, “The use of live ammunition against protestors and resulting deaths are clear violations of international law and human rights.” He also called for an independent investigation of the Palestinian deaths. “We demand that our government condemn the shooting of Loubani, if not the killing of the 55 other Palestinians,” declared Thomas Woodley, President of CJPME. “While the shooting of Palestinians civilians is unlawful, the shooting of medical personnel is even more egregious,” continued Woodley. Many pundits pointed out the incongruity between the killings in Gaza, and the nearby fanfare of the inauguration of the new U.S. embassy in Jerusalem. Current events suggest that CJPME was correct in disagreeing with U.S. president Trump’s assertion that the move of the embassy was a step toward peace. Seventy years have passed since the state of Israel was established in Palestine. As a direct result, hundreds of Palestinian villages were destroyed, thousands were killed and and hundreds of thousands were rendered homeless. For Zionists, 15 May 1948, marks the culmination of ambitions to create a Jewish-majority state; for Palestinians, it marks what came to be known as al-Nakba: the Catastrophe. Independent Jewish Voices Canada (IJV) is a grassroots organization grounded in Jewish tradition that opposes all forms of racism and advocates for justice and peace for all in Israel-Palestine. Today, IJV stands in solidarity with Palestinians marking and mourning 70 years since the 1948 Nakba. Palestinians say, “the Nakba continues!” and it is the shameful truth. The Israeli government systematically imprisons Palestinian children, it continues to colonize Palestinian land for Jewish-only settlement in collaboration with the Jewish National Fund, and of course denies Palestinian refugees their right to return. The ongoing Nakba has perhaps been hardest on Palestinians in Gaza, who live in what is known as the world’s largest open-air prison, largely cut off from the outside world and subject to repeated aerial bombing campaigns. We dedicate a special message of solidarity to them, currently mourning the death yesterday and today of more than 60 people and the wounding of over 2000 others by Israeli snipers. The bravery they exhibit in facing the Israeli army speaks to the desperation of their situation, but also of the undying Palestinian will for justice and return to the land they call home. Let this latest string of massacres be a wake up call to the world. We call on Canadians, and fellow Jewish Canadians in particular, to join us not only in acknowledging and mourning the Nakba, but in doing all that we can to put an end to it. In July 2016, Mennonite Church Canada passed a resolution regarding Palestine-Israel. The resolution was brought forth after more than 60 years of Mennonite service in the region and in response to the calls for justice from our Palestinian Christian brothers and sisters through the 2000 Kairos Palestine Document, “A moment of truth,” to end Israel’s illegal occupation. As a people rooted in Anabaptism, we remain committed to peace and living in right relationships with all of humanity. Our peace witness requires accountability, and therefore we write this statement with grave concern over the situation in Gaza, in particular within the last three weeks. As protesters marched toward the border, they were met with severe repression from the Israeli military. Protesters faced tear gas shot from drones, rubber-coated steel bullets, and live ammunition from snipers. Twenty-one unarmed protesters were killed and more than 1,200 wounded, causing a state of emergency to be declared in Gaza hospitals. One week later, in a follow-up action, Palestinian protesters marched to the border. Again, they were faced with excessive violence from the Israeli military. Eight unarmed protesters were killed. Included in the deaths is local journalist, Yaser Murtaja. Murtaja, who was covering the protest wearing a vest with “Press” written in large letters across the front and back. Murtaja was killed by a bullet from a sniper. The targeting of journalists is in contravention of international law. While we express our concern over the events of the last few weeks, we recognize that Gaza has been in crisis for far longer. In 2007, Israel imposed a blockade on Gaza, forbidding the entry and exit of certain products, as well as imprisoning the entire population. Due to the blockade, Gazans have not been able to rebuild most of what was destroyed during the three wars on Gaza. Without adequate electricity, hospitals have been unable to run at full capacity, while medical workers say they are quickly running out of medical supplies. Meanwhile, Gaza’s water table has been destroyed. The United Nations has stated that if the blockade continues, Gaza will be unlivable by 2020. MC Canada is committed to peace, and we yearn to see a peaceful and just solution to what is happening in Palestine and Israel. Because we believe in nonviolence and are committed to the values of Jesus, we love and are in relationship with both Palestinians and Israelis, and are committed to the safety and security of both. However, part of love and being in authentic relationship is accountability. To implement this call, and in the necessity of accountability, we call upon the Government of Canada to put pressure on Israel to abide by international law through economic sanctions. As a peace church, we do not advocate for military intervention. However, the violence that Israel is imposing needs to end; through sanctions, this accountability can be carried out nonviolently. Condemn Israel’s use of lethal force to suppress peaceful protest. Demand an independent and transparent investigation into the killing and wounding of unarmed Land Day protesters by Israeli forces. Work for a sustainable peace for both Israelis and Palestinians. Call for economic sanctions by the Canadian government and the United Nations until the siege is lifted and a comprehensive solution is found. The members of the Socialist Project wish to express solidarity with the Palestinian “Great Return March” in Gaza, in addition to the ongoing non-violent movement in the West Bank against Israeli occupation and colonization. This movement, and international solidarity efforts in support of it, represents the most hopeful path to end the Israeli occupation and colonization of Palestinian land. As the occupation is carried out with the crucial support of the Canadian and U.S. governments, it is the duty of citizens in these countries to support the Palestinian struggle for human rights. On March 30, the Israeli military perpetrated what appears to have been a deliberate massacre of non-violent demonstrators in Gaza, killing at least 17 and injuring 1,400. Almost half of these were children. While Israel routinely carries out mass killings of Palestinian civilians in the Gaza strip, the massacre nonetheless stands out as a particularly flagrant attack on non-violent demonstrators with no conceivable pretext. With this attack, the Israeli military (IDF) has followed through on threats it made to organizers and supporters of the march in the weeks leading up to the demonstrations, and has once again revealed the absurdity of its purported commitment to democracy and human rights. Israel’s baseless claims that the protests are merely a “ploy” by Hamas to “carry out terror attacks” are intended to justify the murder of unarmed civilians demanding basic human rights. These demands are supported by international law as well as nearly every country in the world – with the marked exception of Canada, the USA, and Israel. In addition, the organizers of the march, which was supported by a wide cross-section of Palestinian political organizations, repeatedly insisted upon the non-violent nature of the march – claims supported by the observations of human rights workers (see also updated casualty numbers) as well as videos posted on social media. It should be noted that this action is unfortunately consistent with Israel’s ongoing brutal suppression of the non-violent movement against the settlements and occupation in the West Bank, which has included the use of live ammunition against unarmed demonstrators, the imprisonment and torture of children, and other harsh methods. The Socialist Project joins the international campaign for Boycott, Divestment, and Sanctions, as well as international civil society and human rights organizations such as Independent Jewish Voices, Jewish Voice For Peace, Amnesty International, and numerous others in condemning the massacre and demanding that violence against the demonstrators cease. We reaffirm our place among the rising chorus of voices from around the world calling for an end to the illegal occupation and colonization of Palestinian land, and the right-of-return for the thousands of Palestinian families displaced and made refugees in the Nakba of 70 years ago. This statement by the Socialist Project was released on 3 April 2018.